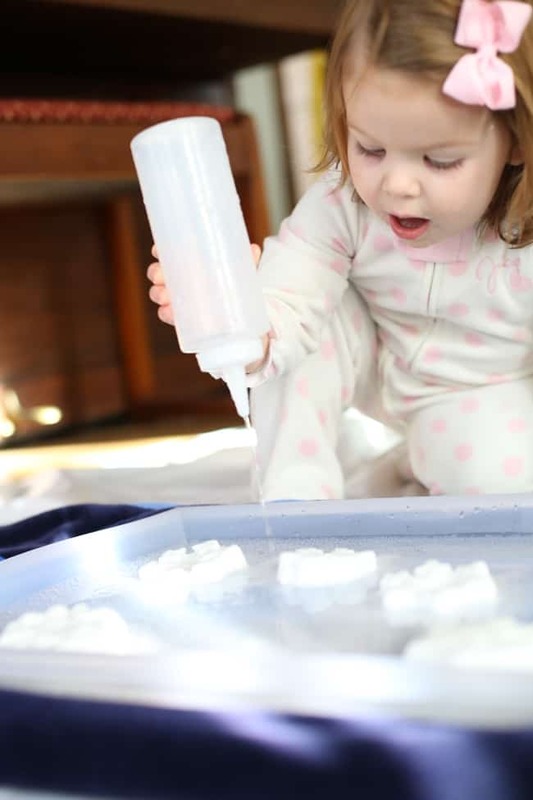 Indoor Activity For Toddlers - Fizzing Snowflakes - I Can Teach My Child! For Day 18 of our 31 Days of Indoor Fun for Toddlers series we decided to try a little toddler chemistry. 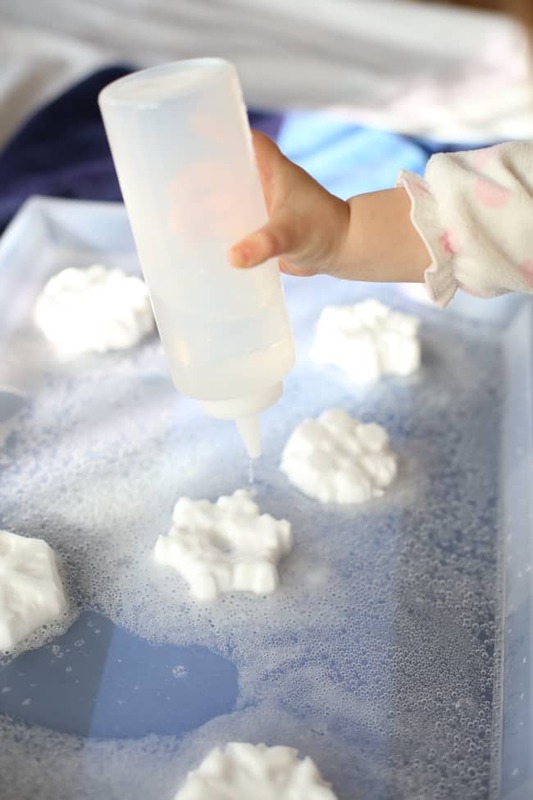 This Fizzing Snowflakes activity is simply a frozen version of the reaction between baking soda and vinegar…but when you are 2 years old, it can be pretty exciting! Safety Note: Both baking soda and vinegar can be painful and dangerous if they end up in your child’s eyes. Little Sister wouldn’t keep goggles on her face but I would highly recommend them. If your child chooses to put her hands in the mixture (like mine did), wash her hands thoroughly afterwards. 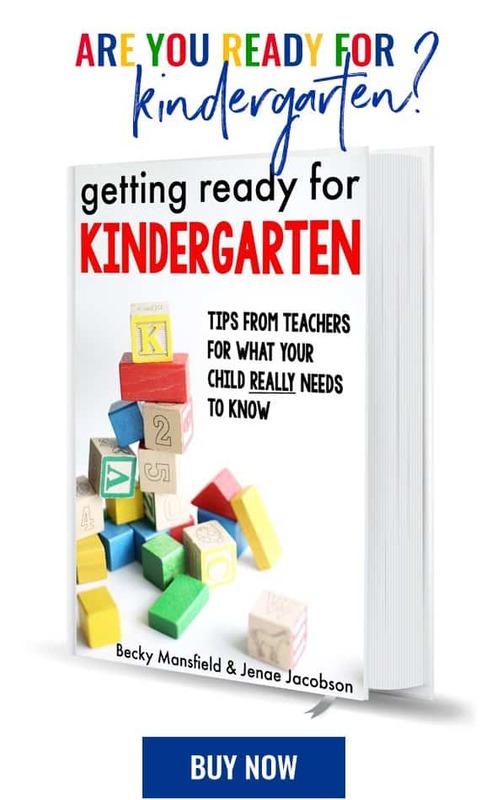 Like all activities shared on this blog, please make sure you supervise your child during the entire activity. 1. Pour baking soda into each of the snowflake molds. Add a little bit of water and mix together–just enough so that all of the baking soda is wet (it should be paste-like). Put the mold in the freezer. 2. Once the snowflakes are completely frozen, get them out of the freezer and put them onto a shallow tray. 3. 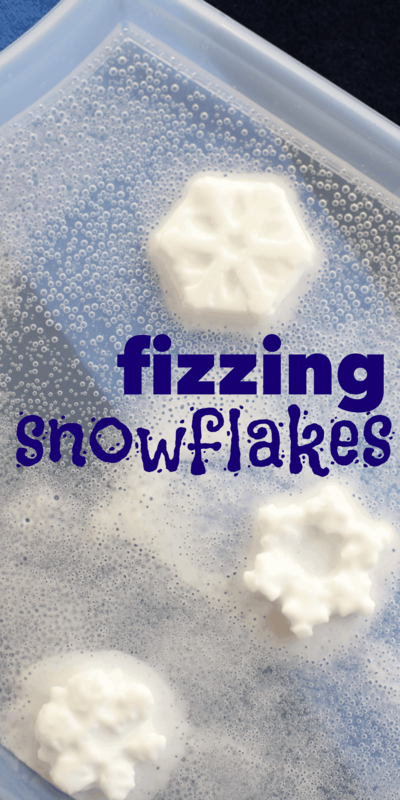 Pour vinegar into the squeeze bottle and let your little one start fizzing the snowflakes! Little Sister was amazed by the sound of the fizzing and all of the tiny bubbles! The great thing about the baking soda snowflakes being frozen is that the reaction seems to last a little longer than normal. Little Sister couldn’t help getting her hands involved…we washed them immediately after she swished them around the tray.